USANA, word! 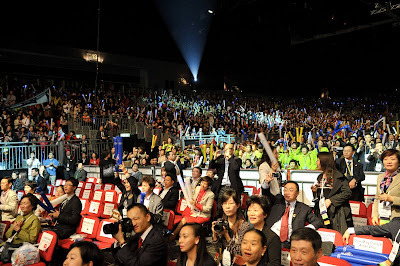 : Want to win the “Best Seat” at USANA AP Convention 2012? Want to win the “Best Seat” at USANA AP Convention 2012? Most of you are aware that 2012 is an important year for the USANA family – it’s our 20th Anniversary! So we have decided to make this year big. The New Year started with a very successful kick-off road show, Connect4$uccess; then followed by the exciting ASB Classic and the Sydney Apia International, reinforcing the partnership between our USANA family and WTA. So what’s next then? We are putting the finishing touches on the next big event ... Asia Pacific Convention 2012! Whether you’ve been with USANA for 12 months or since we began 20 years ago - you must have a lot to say about how USANA has changed your life. Now, here is the chance for you to speak loud to the world and get rewarded! How has USANA changed your life? by either leaving the comment below, or sending an email to facebook@au.usana.com, before 22nd February. Don’t forget to include your full name and Associate ID in the wordings. We have reserved six of the ‘best seats in the house’ in the General Sessions for three lucky winners with their partners! This means, as a winner, you will sit right amongst the USANA Diamonds and top managers, for almost three days! You will not only get the best view of all the performances and presentations, but also get the opportunity to learn from Diamonds. You can write either in English or Chinese. To be eligible for the competition, you will need to purchase and register your ticket for the convention. If you haven’t purchased yet, ring your local Customer Service office for help. To check out the pricing info, visit the AP website. Keep an eye out for the upcoming convention blogs, or Facebook postings about the convention @USANA Asia Pacific Convention 2012, where we will offer you more chances to win more prizes.